A new pan from Williams-Sonoma inspired Crustless Breakfast Tarts with Mushrooms and Goat Cheese. Recently my sister Laurel gave me a very generous gift card for William-Sonoma, a store that's always a wonderful splurge for me. (Thanks Laurel!) So I went to the Salt Lake William-Sonoma (where my friend Bobbyanne is the manager) and started looking around for something fun. They happened to be having a sale on bakeware, and when I spotted a fabulous tart pan I experienced one of those unexplainable flashes of cooking inspiration and my mind went immediately to a custardy egg mixture baked in the shape of a tart. 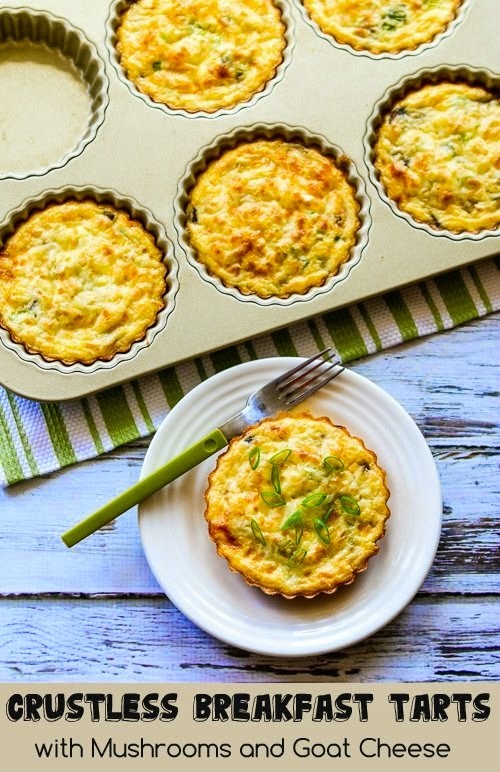 It took several tries to come up with these delicious Crustless Breakfast Tarts with Mushrooms and Goat Cheese, but I loved this for a savory breakfast treat, and I can tell the new tart pan will be inspiring more interesting egg dishes. But what if you don't want to buy a special tart pan just to make this dish? Use large muffin cups or individual gratin dishes to bake this delicious mixture of eggs, goat cheese, cream, Parmesan, mushrooms, green onions, and Mozzarella. My breakfast tarts are about 4 1/2 inches across, so if you bake in something smaller you might have to increase the baking time a couple of minutes for a thicker tart. If you like mushrooms and goat cheese, I promise that this is a lovely way to start the day! Why the truth matters-Or does it in this case?